A couple of days ago, Apple held its yearly conference and announced the new iPhone 4, to be released June 24. At the same time, modern iPhones will also be able to update to the new iPhone OS 4.0 (now called “iOS”). The new iOS offers multitasking and other new features, and also brings the iBooks e-book reading app and the iBooks Store to the iPhone and iPod Touch. Apple also announced that they have sold 2 million iPads in the first 65 days, and had 5 million e-book downloads in that time. Now, Apple is famous for hype and the “Steve Jobs Reality Distortion Field,” and they like throwing out impressive numbers that may or may not mean what they seem. 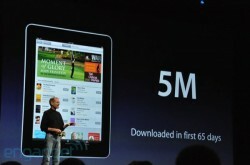 For example, Apple neglected to mention how many of those 5 million e-books were paid vs. free downloads. If they’ve sold 3 or 4 or 5 million e-books in their first 2 months, that’s a big deal. But if they sold 500,000 and gave away 4.5 million free downloads … not so much. Also, the numbers work out to 2.5 books per iPad — or only about one book a month, which suggests that iPad owners are not generally voracious readers. Apple also announced that the publishers they work with claim Apple already accounted for a staggering 22% of their e-book sales, but this number also wasn’t explained and must be taken with a grain of salt. First, many publishers don’t release sales numbers, nor do big e-book sellers like Amazon. Second, Apple only has 5 of the 6 largest publishers’ titles in the iBook Store, but lack the largest (Random House) and most smaller publishers; the “Apple 5” account for less than 50% of all e-book sales. The iBook Store currently has about 30,000 paid titles, whereas the Kindle Store has over 600,000 (20x more). Also, one of the “Big 6,” Penguin, had a disagreement with Amazon for much of the last 2 months and its new titles weren’t available in the Kindle Store. So maybe Penguin told Apple that they accounted for 22% of Penguin’s e-book sales (when its newest, most popular titles weren’t available on Amazon)? But I have a hard time believing that the iPad could do so well against Amazon (who had a 70%-90% e-book share), B&N, Sony, Kobo, and all the other established e-book retailers and jump out to a 22% share right out of the gate. Keep in mind that not only does Amazon have an estimated 3 million Kindles sold, but people can read Kindle titles on Kindle for PC, Mac, Blackberry, iPhone … and iPad. In any event, the numbers sound impressive, even if they are exaggerated a bit. I’m interested to see if people will really read much on the iPad. I’ve talked about reading on the iPad before, and concluded that I prefer the Kindle for pure reading, and that the iPad’s many distractions seem to appeal to a different demographic than serious readers. Whether people will read or not on iDevices will soon become a huge question in the industry, because iOS 4.0 will bring the iBook reader app and iBook Store (where you can sample, purchase, and download e-books) to the iPhone and iPod Touch. I don’t know how many people read novels on their phones, although surveys always surprise me with how many people do it (personally, I prefer a larger, e-Ink screen to read on). But, even a relatively small percentage of iDevice owners could be huge, since there are nearly 100 million iPhones and iPod Touches out there, and Apple has 150 million credit cards in its 1-Click database. In other news for the iBook app, a forthcoming update will add features that Kindle (and Kindle for iPhone/iPad app) users already have: bookmarking, highlighting, and syncing your position in your books across all your devices — so you can read to Chapter 4 on your iPad, then grab your iPhone and automatically pick up where you left off. Another cool feature is that the iBook app will also read PDFs and store them on a separate virtual bookshelf from your e-books. In any event, it’s exciting news, since the reach of e-books has just expanded from a few million people (who owned Kindles, Nooks, and iPads) to 100 million iPhone users. With the ability to browse the iBook Store, make a 1-Click purchase (from a trusted source and without having to make a new account), and get instant wireless e-book downloads, will this be the tipping point for the wide-scale adoption of e-books? Time will tell…. Is Apple (iPad, iBooks) Serious About Reading?